The mandiblard family(ヒメアギト科?, lit. : "Princess Jaw family") consists of seven known species, two of which demonstrate a degree of sexual dimorphism not uncommon to insects. On a whole they have little vitality and are not especially dangerous, but like the Cloaking Burrow-nit, they are infamous for tearing apart nearby stick bridges which Pikmin have built. In the main games, due to their general inability to present any danger, these enemies are usually found in groups of three or more, and are nearly always buried in the ground, appearing only when a leader or Pikmin approaches close by. In Hey! Pikmin, most of them are found constantly outside of the ground. This game also introduces four members of the family, making about half the members exclusive to Hey! Pikmin. In the first two games, members of the mandiblard family will gradually lose health while in water. Sheargrubs, Shearwigs, and Sporegrubs in this family are in the Himeagea genus, Shearblugs are in the Rotundus genus, Speargrubs are in the Dentefaber genus, and Queen Shearwigs are in the Turbulens genus, revealing they are completely different from normal Shearwigs. All enemies that are known not to have Himeagea as a genus name, instead have it as a species name. This is likely a mistake, since arguably every enemy in the family is supposed to be under Himeagea, and these enemies's genus names should actually be their species. This has not been confirmed, however. Female Sheargrubs are a much lighter color than the males and have significantly smaller mandibles, making them unable to cause direct harm to a leader or any Pikmin, though they are still a menace to bridges. They can be ignored in most situations, perhaps only useful as a means of easy-access nectar, which they will produce if killed while petrified. Male Sheargrubs have a dark purple shell and large mandibles. They are capable of attacking leaders and the Pikmin, but are not a serious threat, as they can only eat one Pikmin at a time. In Pikmin, when a Male Sheargrub has a Pikmin in its mouth, it is invulnerable to most attacks and can only be defeated either after it has eaten its prey, or if another Pikmin is thrown directly onto its back. This was fixed in Pikmin 2, allowing players to kill them by any method even if they have a Pikmin in their jaws. The Queen Shearwig is a large mandiblard, and leader of a swarm of Shearwigs in a boss battle. It rarely attacks directly, instead choosing to send its army of Shearwigs to attack Captain Olimar and the Winged Pikmin with him. The Shearwigs also serve as protection to their queen, which can only be reached once the Shearwigs in the way are cleared. The Shearblug is an amphibious enemy encountered in Hey! Pikmin. It resembles a Female Sheargrub with a longer, more grub-like body and spots on its sides. It attacks by curling into a ball, forcing spikes to emerge from its back, then rolling toward Olimar. It can be defeated by throwing a single Pikmin onto it when its spikes are retracted. Shearwigs are enemies in all Pikmin games. The females of this species are never seen, as they spend nearly their entire life underground. The males have a dark green shell, sporting simple wings and large, sickle-shaped mouthparts. They are slightly more aggressive than Male Sheargrubs and will fly to safety when their health reaches half; up in the air, they regain health. One well-aimed Pikmin will bring a flying Shearwig down for good. Both Sheargrubs and Shearwigs will drown quickly in water, so luring them into a pool is an alternative strategy. Shearwigs deal the most damage to leaders out of any enemy in Pikmin 2. Speargrubs are a type of mandiblard encountered in Hey! Pikmin. They are green in color, with a small, teal mouth and spikes lining their back. They emerge from holes in walls against the background, and slowly crawl down until they duck into another hole, where they will return to the first hole and repeat at regular intervals. They do not actively pursue Pikmin, but are still hazardous due to the spikes, so they should be treated as an obstacle. Rock Pikmin cannot be hurt by the spikes, and throwing one at a Speargrub will cause it to freeze in place for a few seconds. However, they cannot be defeated and must simply be avoided. Sporegrubs are a type of mandiblard found in Hey! Pikmin. Unlike other members of the mandiblard family, Sporegrubs have no visible mouths. Their heads are dark brown with bright green eyes, and their bodies are purple with pink spots. Two rows of spikes line their backs, though these are just for show and don't harm the Pikmin. They also have six tiny legs, making them the only mandiblard to have visible limbs. When approached, Sporegrubs attack by expelling poisonous gas that will instantly kill Pikmin. They crawl along set paths against the back wall that they appear from. They can be defeated by a single Pikmin thrown onto them. Swarming Sheargrubs are a green subspecies of the mandiblard family, quite similar to the Female Sheargrub. They are found only in Pikmin 3, usually in groups of six to eight. They can drink nectar to increase in size and weigh objects down. When attacked, the entire group goes into a panic and scatters. Swarming Sheargrubs can't attack the player or Pikmin, making it the second member of this family to be completely harmless. It is unknown if they can eat stick bridges since the bridges in Pikmin 3 are made of clay Fragments. Their mandibles are shorter and stubbier than a Female Sheargrub's, but only by a little bit. Although they have many similarities to the Female Sheargrubs, they do not have a known gender. The family's name comes from the word "mandible". The names of the members derive from the word "shear", given that the sound they make when chomping down bridges sounds strikingly similar to a real world pair of shears closing. 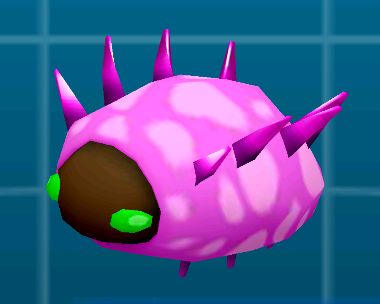 The Sheargrubs' names also derive from the word "grub", since they're like real life worms. Their Japanese names use the term ウジンコ?, in which ウジ? means "maggot", and インコ? means "parrot". The "parrot" part might reference their mouth, which looks like the beak of a parakeet, but also their ability to destroy bridges since parakeets are known for digging holes in wood to make their nests. The genus name of this family's members is Himeagea, whose meaning is unknown. However in the Japanese games their Japanese name and family name is ヒメアギト? which is where Himeagea probably derived from. In Pikmin, all mandiblards share the same internal name, Kabekui. かべ? means "wall" and くい? meaning "eat". The fact that they are called "wall eater" instead of "bridge eater" seems to indicate that, during development, these creatures served a different purpose. In Pikmin 2, if a member of the mandiblard family is coaxed into water in the Piklopedia, it will actually die. This page was last edited on April 19, 2019, at 15:31.